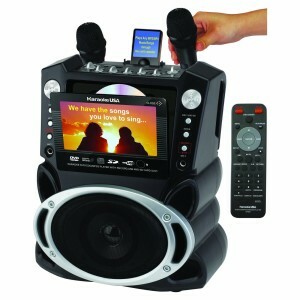 If 150 dollars for a karaoke machine is something you would do then you do not need to read any further. 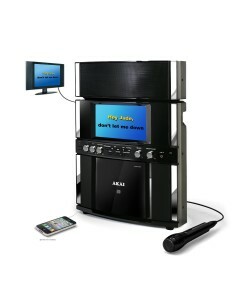 The Karaoke USA machine is the standard to which all of the other machines will be compared to and be found wanting. 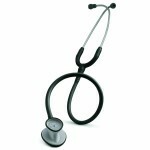 Its only real defect is that it is twice, even thrice as expensive as the other system. However, it does come with its own two microphones, supports USB, DVD, micro SD, and auxiliary input. It can also record the songs and has a relatively decent stereo speaker which does not introduce that many audio distortions at maximum volume. Finally it has its own 7 levels balance control which almost makes this a professional grade machine. Still, assuming you do not want to break the bank on a karaoke machine we are going to go on and look at a few other very interesting machines. 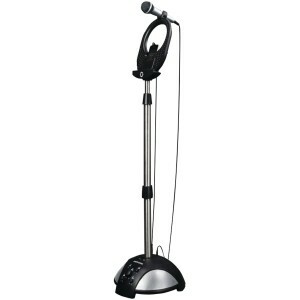 The Memorex MKS-SS2 is a karaoke stand that can be connected to two microphones but by default only comes with the one. It can be connected to any audio device but it really works best with Apple products. With the machine comes a free membership to the Memorex website where you can download additional songs for karaoke. However, the Memorex can also reduce the voice on any given track and increase the level of your voice so you do not even need specialized karaoke tracks to use it. 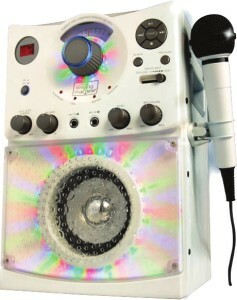 The Singing Machine can be the only party accessory you will need as it also comes with its own party lights. 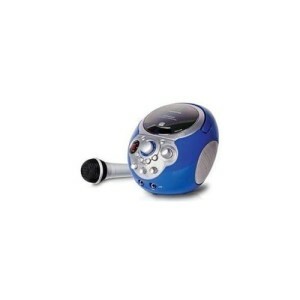 It comes in at number three on our list because it has only a single audio input method and that is a CD player. However, that CD can be more than enough if you plan your parties with a little care. It also has support for two microphones but comes equipped with just the one microphone. The Memorex MKS-SS1 is the original Memorex that most of the people who got into karaoke about two years ago probably still own. It is precisely because there are so many people who have been using the original Memorex MKS that we have decided to feature it here. It has the same features as the original version but its voice recognition software is not as good as the one on the MKS-SS2. 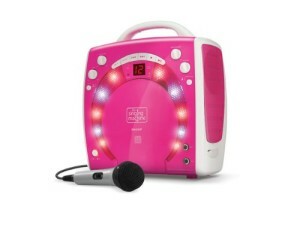 The Singing Machine SML-283P would make an excellent present for a girl or a girls party because of its pink color, flashy lights and simple design. It has an auto voice control level that either lowers or increases the volume of the voice to perfectly match it with the song. It has 2 separate microphone jacks although it only comes with the one microphone and it has separate volume control for both. 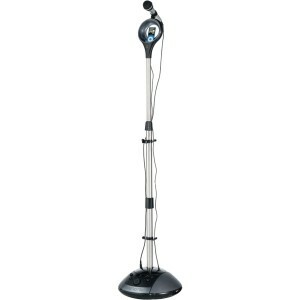 Having already featured the Singing Machine SML-385W, you knew that we would also have to feature the SML-385. The only difference between the two of them is that the SML-385W is white, hence the W, and this one is black. For the rest, in terms of performance, microphones available in the package and microphone jacks, everything stays the same. The reason why we set the SML-385 so further down the list is because the white machine fits better with the karaoke scene. The best thing about the Electrohome Karaoke Machine is its proprietary software singing coach that really does a great job of teaching you a tune. Most of the times, when choosing your favorite karaoke tune, you will probably know it by heart after hundreds of hours of shower concerts. However, if have just heard a new, great song you might need a little help from the audio coach. The real disadvantage of this machine is the fact that you will have to connect it to a TV in order to be able to follow the lyrics in real time as the song progresses. 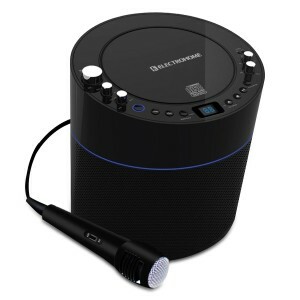 The Portable Karaoke Machine by Memorex is just that: a relatively simple, easy to carry karaoke machine that you can easily throw in a backpack and bring it with you to any party. It does not offer the extra levels of volume the other machines have, but it does sound very nice and crisp. 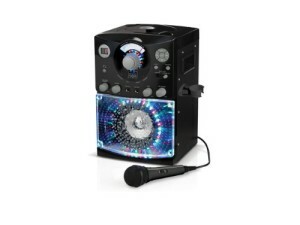 What’s even better is the fact that this is one of the very few karaoke machines that also works on batteries so you can truly bring the fun with you anywhere you go. 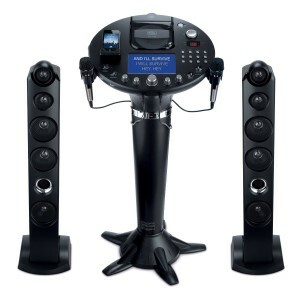 The Singing Machine iSM1028Xa is the other karaoke machine in our top 10 best karaoke machines that costs well over 100 dollars. As such our expectations of its performance were thrice as high as for the other machines and we were not excited about what we got. The two tower speakers do look very impressive but they do not sound that much better than the base speaker on the Memorex tower. The machine also comes with an FM function, which is great since most of the time when you want to start singing to a tune it is because you come across it on the radio. However, during FM function the karaoke system does not work. The Akai Karaoke KS800 is certainly a step in the right direction with its much bigger hardware and excellent sound quality. 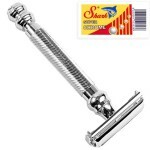 However, various software glitches brought it down to only a 3.2 stars Amazon rating. So we did decide to include it in our top 10 best karaoke machines list, but only at number ten because we are still waiting for the 2.0 version.